For most manufacturers and operators, who have equipment spread across geographically dispersed sites and maintained by multiple crews, maintaining a clean and accurate installed base repository is a daunting task. With siloed tracking systems and approaches, it’s nearly impossible. 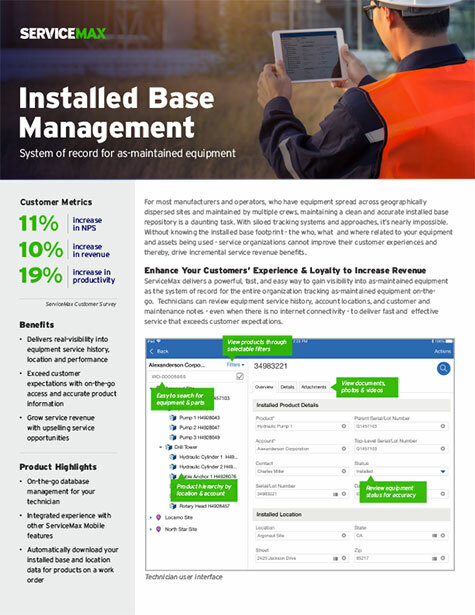 Without knowing the installed base footprint - the who, what and where related to your equipment and assets being used - service organizations cannot improve their customer experiences and thereby, drive incremental service revenue benefits. ServiceMax delivers a powerful, fast, and easy way to gain visibility into as-maintained equipment as the system of record for the entire organization tracking as-maintained equipment on-the-go. Technicians can review equipment service history, account locations, and customer and maintenance notes - even when there is no internet connectivity - to deliver fast and effective service that exceeds customer expectations.